One in seven hospital patients experience adverse drug reactions, half of which are completely avoidable, a study found. The Liverpool University-led research followed more than 3,000 patients over a six-month period. The study found complications ranging from constipation to internal bleeding - and in a few cases death. 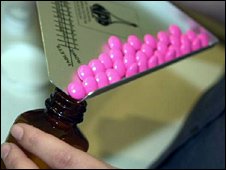 The researchers said UK hospitals had to improve their monitoring and prescription practices. Doctors agreed it was a major problem and said improvements had to be made. There has been widespread research into adverse drug reactions in the community, but this is the first time there has been a study of this size into hospital-based problems. The team looked at patients in 12 hospital wards in Merseyside, but said the findings would be common across the rest of the UK. Researchers said the drugs most commonly associated with the adverse reactions were anticoagulants, analgesics and diuretics. They reported that a reaction increased the length of stay in hospital by a quarter of a day on average, with elderly patients on a number of different medications being the most susceptible. The study, carried out for PLos One, the journal of the Public Library of Science, also found that a small number of deaths could be linked to the adverse reactions. In 14 cases, the reactions had contributed to a death and in one case it had directly caused it. In just under a fifth of cases, the course of drugs was started outside the hospital, although the adverse reaction, monitoring and continued prescription all happened on the ward. The findings are broadly similar to what has been reported elsewhere in the world, but the team still said the NHS could improve its performance. Lead researcher Professor Munir Pirmohamed said: "There is no easy solution, but we can and have to do better as it is putting a burden on the NHS. "Hospitals should look to improve their monitoring of patients and doctors should also consider in what situations patients are given drugs, how long they are put on them and consider if it is always necessary." Jonathan Fielden, chairman of the British Medical Association's consultants committee, said it was an international problem that needed addressing. "It is vital that doctors and patients understand the need to regularly review prescriptions and personally tailor treatment to clinical need." And Dr Rodney Burnham, of the Royal College of Physicians, added medical schools and doctor training needed to make safer prescribing more of a priority. Joyce Robins, of Patient Concern, said the findings did not surprise her. "We get a lot of complaints from patients about the lack of checks and procedures regarding drugs in hospital. "Patients say they are not asked about allergies or what medication they are already on. They also say medication comes at all the wrong times. It is something that needs to be tackled."